The creators of Bug! 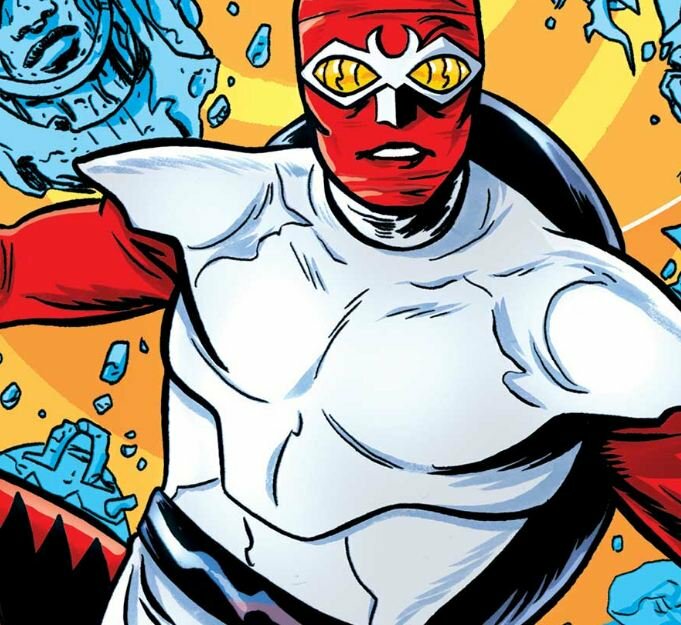 Adventures of Forager are coming to our local comic book shop today! Seven year-old No. 1 and I read Bug! starting about a year ago. I picked up a copy when we went to the same funny book shop to meet the creators of another of our favorites, Doom Patrol. Both comic books are produced by the DC Comics imprint, Young Animal. The book written by Lee Allred, drawn by Michael Allred, and colored by Laura Allred picks up where DC's 1988, Cosmic Odyssey left off. Turns out Bug wasn't dead at the end of the '88 book he was, "...merely dormant. Science, blah blah blah." Bug, aka Forager, almost immediately encounters a talking teddy bear, and a ghost girl. The three become fast travelling buddies, after an accident triggers a Mother Box made of Dominoes to open portals that trundle them between adventures set in the realities of Jack Kirby's many, many superhero characters. The six issue comic book series is great fun to read because the story is--there's no other way for me to say it--adorable, and the art is a pleasure to look at . There's always something new going on with amusing puns and unexpected plot pivots. There are also so many layers to the book, and so many things to learn! First, there are all the Kirby characters. So much comic book history squeezed into so few pages! But, there's more than juts that. Every issue contains references to other fascinating aspects of our own non-fictional world. There are literary trails that lead off to famous French philosophers, The Himalays, and Chinese mythology, just to name a few. There's also a secret decoder ring! Lee Allred published liner notes, (from which the above excerpts were taken), that point out the finer points of each issue on Twitter. You can head into the liner notes below By the way, don't head past the notes, because there are spoilers! OK, if you read this far down, don't go further unless you've read the story! So, it turns out the book has one other aspect that makes it near and dear to my heart. The gang of kids here spend their days out on adventures with their Director of Tactical Ops, traveling through San Francisco, and other Bay Area cities learning the environment, exploring new places, and meeting new people. As it turns out, that's exactly what Forager, Kuzuko, and the bear are up to as well! That's right, unbelievably, this is a a six issue comic series about adventure days!